Overexpression of cyclin D1 dependent kinases 4 and 6 (CDK4/6) is a common feature of many human cancers including leukemia. LEE011 is a novel inhibitor of both CDK4 and 6. To date, the molecular function of LEE011 in leukemia remains unclear. Leukemia cell growth and apoptosis following LEE011 treatment was assessed through CCK-8 and annexin V/propidium iodide staining assays. Cell senescence was assessed by β-galactosidase staining and p16INK4a expression analysis. Gene expression profiles of LEE011 treated HL-60 cells were investigated using an Arraystar Human LncRNA array. Gene ontology and KEGG pathway analysis were then used to analyze the differentially expressed genes from the cluster analysis. Our studies demonstrated that LEE011 inhibited proliferation of leukemia cells and could induce apoptosis. Hoechst 33,342 staining analysis showed DNA fragmentation and distortion of nuclear structures following LEE011 treatment. Cell cycle analysis showed LEE011 significantly induced cell cycle G1 arrest in seven of eight acute leukemia cells lines, the exception being THP-1 cells. β-Galactosidase staining analysis and p16INK4a expression analysis showed that LEE011 treatment can induce cell senescence of leukemia cells. LncRNA microarray analysis showed 2083 differentially expressed mRNAs and 3224 differentially expressed lncRNAs in LEE011-treated HL-60 cells compared with controls. Molecular function analysis showed that LEE011 induced senescence in leukemia cells partially through downregulation of the transcriptional expression of MYBL2. We demonstrate for the first time that LEE011 treatment results in inhibition of cell proliferation and induction of G1 arrest and cellular senescence in leukemia cells. LncRNA microarray analysis showed differentially expressed mRNAs and lncRNAs in LEE011-treated HL-60 cells and we demonstrated that LEE011 induces cellular senescence partially through downregulation of the expression of MYBL2. These results may open new lines of investigation regarding the molecular mechanism of LEE011 induced cellular senescence. Acute leukemia is the most common pediatric malignancy constituting more than 30% of all childhood cancers . Approximately 300 important genes have been reported to be altered in hematologic malignancies. Pediatric acute myeloid leukemia (AML) accounts for more than 50% of pediatric acute leukemia patient deaths. More effective therapeutic strategies are needed to improve prognosis. Recently, the potential therapeutic application of CDK4/6 inhibitors in a range of cancers has been considered. The proteins encoded by CDK4 and 6 are members of the Ser/Thr protein kinase family . Both CDK4 and 6 are important for cell cycle regulation, specifically G1 phase progression, with their activity strictly restricted to the G1-S phase [3–5]. Mutations in these genes have been found to be significantly associated with tumorigenesis of several cancers [6, 7]. It is now believed that the vast majority of human tumors exhibit deregulation of the CDK4/6-cyclin D-INK4-RB pathway through multiple mechanisms [8–10]. CDK4/6 amplification or overexpression has also been observed in a range of tumors, including lymphomas, melanomas, gliomas, sarcomas, carcinomas of the breast and leukemias. For example, CDK6 promoter related chromosomal translocation leads to CDK6 overexpression, which has been reported in B cell lymphocytic leukemias and splenic marginal zone lymphoma [11, 12]. Several pharmacological inhibitors of CDK4/6 have been developed and many are currently being tested in clinical trials. One CDK4/6 selective inhibitor, PD-0332991, causes G1 arrest and growth inhibition in xenograft models of human tumor cell lines including breast, ovary, lung and multiple myeloma. Another CDK4/6 inhibitor, LY2835219, has been reported to inhibit CDK4 and 6 at very low concentrations, resulting in proliferation inhibition and G1 cell cycle arrest . GCS-100 is a non-selective CDK6 inhibitor which induces inhibition of proliferation and apoptosis in myeloma cell lines . KBH-A42 is a new synthetic histone deacetylase inhibitor which can effectively inhibit the growth of several cancer cells . Results suggest that the molecular mechanism of KBH-A42 mediated cell cycle arrest may be the result of the down regulation of CDK4 and CDK6 . LEE011 is a recently developed CDK4/6 inhibitor . LEE011 has shown antiproliferative effects in a panel of human cancer cell lines and primary tumor xenografts. For example, oral administration of LEE011 to mice bearing human liposarcoma xenografts resulted in approximately 50% reduction in tumors . Further studies have shown that treatment with LEE011 significantly reduced cell proliferation in 12 of 17 human neuroblastoma cell lines [17, 19]. To date, the molecular function of LEE011 in leukemia is unclear. In this study the antitumor effect of LEE011 was evaluated in leukemia cells to further characterize its preclinical efficacy and molecular mechanism. Leukemia cell lines HL-60, MV4-11, U937 and K562 were obtained from the American Type Culture Collection (ATCC). CCRF, 697 and SHI-1 cell lines (gifts from The Cyrus Tang Hematology center of Soochow University). NB4 and THP-1 cell lines (gifts from Hematology Institute of Soochow University). All cell lines were maintained at 37 °C in the RPMI 1640 (GibcoR, Life Technologies, Carlsbad, CA, USA) supplemented with 10% fetal bovine serum (Invitrogen, Life Technologies, Carlsbad, CA, USA). LEE011 (Cat: S7440 Selleck Chemicals, West Paterson, NJ, USA) was dissolved in DMSO (Cat: D4540 Sigma-Aldrich, St. Louis, MO, USA). Bone marrow specimens were obtained at the time of diagnosis from 5 pediatric AML and 5 ALL patients between 2014 and 2015. Ethical approval was provided by the Children’s Hospital of Soochow University Ethics Committee (No. SUEC2013-022), and written informed consent was obtained from the parents or guardians. They will be given the opportunity to withdraw from the research at any time prior to the publication of the research findings. The matter of how data will be collected and stored, with reference to the data protection legislation will be clarified for participants, with information being stored in locked cabinets or on IT hardware protected with the highest security software. The main clinical and laboratory features of the patient cohort are summarized in Tables 1 and 2. Bone marrow mononuclear cells (BMNCs) were isolated using Ficoll solution within 2 h after bone marrow samples harvested. Cell proliferation analysis was almost same as introduced before . Leukemia cells were incubated with DMSO, or increasing concentrations of LEE011 (0.05–80 μM) for 24 h. CCK8 Kit (Dojindo Molecular Technologies, Japan) was used to analyze the cell survival rate. The IC50 of LEE011 inhibitor was calculated by Graph Prism software. Cell cycle analysis was also introduced before . Leukemia cells were collected, fixed, incubated with 1.5 μmol/l propidium iodide (P4170, Sigma-Aldrich, St. Louis, MO, USA) and 25 μg/ml RNase A The samples (1 × 104 cells) and were analyzed with a Beckman Gallios™ Flow Cytometer. Then these data was analyzed with cell cycle software (MultiCycle for Windows). Apoptosis assay was according to the manual operation of BD Annexin V Staining Kit (Cat: 556420, BD Biosciences, Franklin Lakes, NJ, USA). All the details have been introduced before [20, 21]. Cells were seeded into 6-well plates, and then treated with LEE011 (2 or 5 μM) and cultured at 37 °C for 24 h, stained with 0.1 µg/ml Hoechst 33,342 (Sigma, St. Louis, MO, USA) for 5 min, then observed with filters for blue fluorescence under fluorescence microscopy (OLYMPUS IX71; Olympus Corporation, Tokyo, Japan). Abnormal nuclear cells were counted between the RO3280 treatment group and DMSO control group . Leukemia cells were seeded into 6-well plates, and then treated with LEE011 (2 or 5 μM) and cultured at 37 °C for 24–72 h, senescence β-galactosidase staining analysis was according to the manufacture of senescence β-galactosidase staining kit (Beyotime Corporation, C0602, Jiangsu, China). Staining cells were photographed with microscopy (OLYMPUS IX71; Olympus Corporation, Tokyo, Japan). Positive staining cells were counted between the LEE011 treatment group and DMSO control group. HL-60 cells were treated with 1 μM LEE011 and control group cells were treated with the same volume of DMSO 24 h later. Human LncRNA array analysis was performed by KangChen Bio-tech, Shanghai P. R. China. And experimental details were introduced by Yu et al. . RNA purification and analysis was introduced as before . Gene ontology (GO) analysis introduced before  is a functional analysis that associates differentially expressed mRNAs with GO categories (http://www.geneontology.org). The lower the P value is, the more significant the GO term (a P ≤ 0.05 is recommended). Pathway analysis is a functional analysis that maps genes to Kyoto encyclopedia of genes and genomes (KEGG) pathways (http://www.genome.jp/kegg/) was introduced before . The P value (EASE-score, Fisher P value or Hypergeometric P value) denotes the significance of the pathway correlated to the conditions. The lower the P value is, the more significant the correlation (the recommend P value cut-off is 0.05). For western blot analysis, protocol is introduced before . Blots were blocked and then probed with antibodies against Caspase 3 (Cat: 9661S 1:1000, Cell Signaling Technology, Inc. Danvers, MA, USA), Caspase 9 (Cat: 4501S 1:1000, Cell Signaling Technology, Inc. Danvers, MA, USA), PARP (Cat: 9542S, 1:1000, Cell Signaling Technology, Inc. Danvers, MA, USA), CDK6 (Cat: 13331S 1:1000, Cell Signaling Technology, Inc. Danvers, MA, USA), CDK4 (Cat: 12790S 1:1000, Cell Signaling Technology, Inc. Danvers, MA, USA), Cyclin D1 (Cat: 2978S 1:1000, Cell Signaling Technology, Inc. Danvers, MA, USA), Cyclin D2 (Cat: 3741S 1:1000, Cell Signaling Technology, Inc. Danvers, MA, USA), RB (Cat: 9313S 1:1000, Cell Signaling Technology, Inc. Danvers, MA, USA), p-RB (Cat: 8516S 1:1000, Cell Signaling Technology, Inc. Danvers, MA, USA), KIF20A (Cat: ab85644 1:1000, Abcam Trading (Shanghai) Company Ltd. Pudong, Shanghai, China), PLK1 (Cat: 4535S 1:1000, Cell Signaling Technology, Inc. Danvers, MA, USA), MYBL2 (Cat:BA3860 1:1000, BOSTER (Wuhan) Company Ltd. Wuhan, Chin), p16INK4a (Cat: ab189302 1:1000, Abcam Trading (Shanghai) Company Ltd. Pudong, Shanghai, China), p21 Waf1/Cip1 (Cat: 2946S 1:1000, Cell Signaling Technology, Inc. Danvers, MA, USA),GAPDH (1:5000, Sigma, St. Louis, MO, USA). CR1L were F: 5′-GTCCTCCTTCTCCGATCAATGC-3′ and R: 5′-CTTAGCACTTGTCCAGACTGAG-3′; TCP11L2 were F: 5′-CTAAATGCTGACCCTCCTGAGT-3′ and R: 5′- GCCACCGGGAGTGAGAAAA-3′; CR1 were F: 5′-AGAGGGACGAGCTTCGACC-3′ and R: 5′-TCAGGACGGCATTCGTACTTT-3′; AMICA1 were F: 5′-GTTTCCCCGCCTGAGCTAAC-3′ and R: 5′-TTCTGGAAGCGCCCAATAGG-3′; MCM10 were F: 5′-AAGCCTTCTCTGGTCTGCG-3′ and R: 5′-CTGTGGCGTAACCTTCTTCAA-3′; CDK1 were F: 5′-AAACTACAGGTCAAGTGGTAGCC-3′ and R: 5′-TCCTGCATAAGCACATCCTGA-3′; DLGAP5 were F: 5′-AAGTGGGTCGTTATAGACCTGA-3′ and R: 5′-TGCTCGAACATCACTCTCGTTAT-3′; KIF20A were F: 5′-TGCTGTCCGATGACGATGTC-3′ and R: 5′-AGGTTCTTGCGTACCACAGAC-3′; S100A8 were F: 5′-CATGCCGTCTACAGGGATGA-3′ and R: 5′- GACGTCTGCACCCTTTTTCC-3′; IL8 were F: 5′-GAATGGGTTTGCTAGAATGTGATA-3′ and R: 5′-CAGACTAGGGTTGCCAGATTTAAC-3′; PLK1 were F: 5′- CTCAACACGCCTCATCCTC-3′ and R: 5′-GTGCTCGCTCATGTAATTGC-3′; MYBL2 were F: 5′-TGCCAGGGAGGACAGACAAT-3′ and R: 5′-CTGTACCGATGGGCTCCTGTT-3′; PADI4 were F: 5′-AGTGGCTTGCTTTCTTCTCCTGTG-3′ and R: 5′-AGCAGAACTGAGTGTGCAGTGCTA-3′. Expression of genes was normalized to endogenous GAPDH expression. Cluster analysis of the data was performed with gene cluster from the real-time PCR arrays. For gene expression quantification, we used the comparative Ct method. First, gene expression levels for each sample were normalized to the expression level of the housekeeping gene encoding glyceraldehyde 3-phosphate dehydrogenase (GAPDH) within a given sample (−ΔCt). The relative expression of each gene was calculated using the equation: 106*Log2 (−ΔCt). Gene expression between the DMSO and the LEE011 samples were analyzed using Multi Experiment View (MEV) cluster software. RNAi lentivirus was purchased from Shanghai Genechem Co., Ltd. (http://www.genechem.com.cn). RNAi products target-specific lentivirus designed to knockdown MYBL2 expression; sequences are 1# 5-CAGATCAGAAGTACTCCAT-3; for KIF20A, sequences are 1# 5- CAGAAGAATATAAGGCTGT-3; for PLK1, sequences are 1# 5-CAACCAAAGUCGAAUAUGA-3. The control sequence is 5-TTCTCCGAACGTGTCACGT-3. Lentivirus infection was according to the manufacture of Shanghai Genechem Co., Ltd. at a final concentration of 100–200 MOI (multiplicity of infection). Interference efficiency was measured by western blot at 3 days after transfection. The rest cells were harvested for further analysis. Each experimental condition was performed for three times, and these replicates were presented in results and figures. All values are presented as mean ± SEM. Student’s paired t test was applied to reveal statistical significances. P values less than 0.05 were considered significant. Statistical analyses were performed using SPSS Software for Windows (version 11.5; SPSS, Inc., Chicago, IL, USA). Western blot analysis showed that expression of CDK6 was very high in seven of nine of the leukemia cell lines investigated, the exceptions being THP-1 and U937 cells (Fig. 1a). CDK4, Cyclin D1 and Cyclin D2 were also examined with Western blot analysis. Our results indicated that there is positive correlation between IC50 and the expression of Cyclin D1. LEE011 is novel CDK4/CDK6 inhibitor with very high specificity (Fig. 1b). LEE011 treatment resulted in inhibition of proliferation of leukemia cells in a dose-dependent manner (Fig. 1c). Cell morphology and cell number of HL-60 and MV4-11 cells were analyzed; there were changes in cell number following LEE011 treatment at concentrations of 2 and 5 µM but no alteration in cellular morphology (Fig. 1d). To better understand the efficacy of LEE011, IC50 values of LEE011 in primary acute lymphoblastic leukemia (ALL) and AML cells were analyzed (Tables 1, 2). Our results showed that in primary ALL cells, the IC50 of LEE011 was 1.73–14.68 µM and in primary AML cells the IC50 of LEE011 was 1.94–8.46 µM (Fig. 1e). These results confirm that LEE011 is an effective anti-leukemia inhibitor. We investigated apoptosis in leukemia cells following LEE011 treatment. 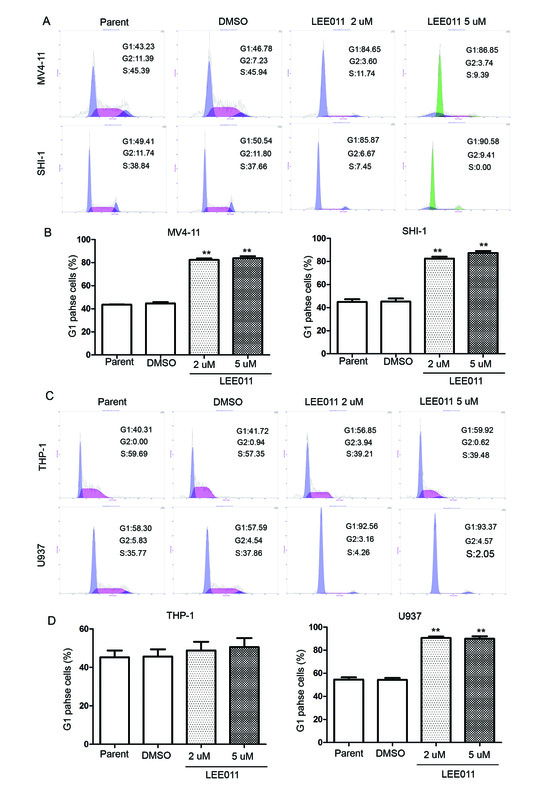 Cells treated with LEE011 at 2 and 5 µM for 48 h showed more apoptotic features when compared to controls in seven leukemia cell lines, the exception being THP-1 (Fig. 2). To further demonstrate whether LEE011 causes apoptosis in leukemia cells, we assessed the expression and cleavage of the apoptosis markers PARP, caspase-3 and caspase-9 by western blot. After 48-h treatment with 2 and 5 µM LEE011, an increase in cleaved PARP was observed in the LEE011 treatment group for both MV4-11 and HL-60 cells (Fig. 3c). Hoechst 33,342 staining analysis showed that DNA fragmentation and an increase in cells with nuclear abnormalities were observed after 24-h LEE011 treatment (Fig. 3a). Abnormal nuclear structure in cells increased significantly compared with DMSO treated control cells in both HL-60 and MV4-11 cell lines (Fig. 3b). The proportion of MV4-11 cells with abnormal nuclear structure in the 5-µM treatment group was 28.93 ± 6.50 vs. 5.60 ± 2.29% for the DMSO group (P = 0.0016); in HL-60 cells, 25.60 ± 3.30% of cells had abnormal nuclear structure in the 5-µM treatment group, compared with 3.27 ± 1.84% in the DMSO group (P = 0.0013). Cell cycle analysis was undertaken on cells treated with LEE011 at 2 and 5 µM for 48 h (Additional files 1, 2). LEE011 significantly induced cell cycle G1 arrest in acute leukemia cells except THP-1 cells (Fig. 4). Cell senescence β-galactosidase staining analysis was used in three leukemia cell lines: MV4-11, HL-60 and NB4. These cells were treated with LEE011 at 2 µM for 24–72 h before analysis (Fig. 5). More cells were β-galactosidase staining-positive following LEE011 treatment compared to DMSO controls. In MV4-11 and HL-60 cells, cell senescence marker p16INK4a was upregulated significantly when the cells were treated with LEE011 for 48 h (Fig. 3c). The Arraystar Human LncRNA 8 × 60 k v3.01 microarray was used to identify mRNA and lncRNA expression profiles in 1 µM LEE011-treated HL-60 cells compared with a non-treated control group. Microarray analysis and original data have been submitted to the GEO database with accession number GSE81060. In the lncRNA and mRNA expression profiling data we identified 2083 differentially expressed mRNAs in LEE011-treated HL-60 cells compared with the controls. Compared with the control group, 116 mRNAs were upregulated and 155 mRNAs were downregulated at the level of >fivefold change in LEE011 treated HL-60 cells. Clustering analysis of these mRNA expression patterns is presented in Fig. 6a, c and Additional files 3, 4. In lncRNA analysis, 3224 lncRNAs were differentially expressed in LEE011-treated HL-60 cells from a total of 33,327 lncRNAs. Hierarchical clustering analysis of the differently expressed lncRNAs (fold change ≥5) is presented in Fig. 6b, d and Additional files 5, 6. In our system hundreds of brain-derived neurotrophic factor (BDNF) related lncRNAs were upregulated, including BDNF-AS (NR_033313, NR_002832, ENST00000530313, ENST00000532965) and BDNF-AS1 (uc009yis.3). BDNF plays an important role in the aging process . BDNF helps to protect neurons from damage caused by infection or injury. A study performed in rats showed that TrkB (a BDNF receptor) is markedly decreased during the aging process . DLGAP1 related lncRNAs such as uc002kmi.3, ENST00000573177, uc010wzb.2, uc002kmj.1, NR_024101, ENST00000575606, ENST00000573355 and ENST00000576606 were also upregulated in our system. DLGAP1 plays a fundamental role in centrosome positioning and cell polarity. Centrosome positioning is crucial for cellular senescence . Gene ontology pathway enrichment analysis was performed for the differentially expressed genes identified through microarray analysis. Fisher’s exact test was used to determine whether the differential expression was greater than that expected by chance. For the upregulated transcripts (Fig. 7a), the most enriched gene ontologies (GOs) included immune response (P = 1.69936E−13), immune system process (P = 1.71894E−13), defense response (P = 3.32706E−13) and response to stimulus (P = 2.09266E−12). For the downregulated transcripts (Fig. 7b), the most enriched GOs included mitotic cell cycle (P = 1.03536E−96), cell cycle (P = 1.62994E−88), cell cycle process (P = 7.37652E−84) and mitotic cell cycle process (P = 1.36566E−81). We further investigated the pathways in which these differentially expressed genes are involved through KEGG database analysis. The five most enriched pathways from KEGG analysis are shown in Fig. 7c, d. Notably, the downregulated pathways included cell cycle and DNA replication pathways. To identify the cellular senescence molecules implicated in the mechanism of LEE011, the expressions of certain dysregulated genes identified in the gene array were confirmed using real-time PCR and western blot analyses. Cluster analysis of the real-time PCR results showed dysregulated genes in HL-60 cells treated with 1 µM LEE011 for 24–72 h (Fig. 7e). Western blot analysis showed the downregulation of KIF20A, PLK1 and MYBL2 (Fig. 8a). These results are consistent with the real-time PCR analysis. Our western blot analysis also showed that LEE011 treatment could decrease the phosphorylation of RB and expression of CDK4/6 (Fig. 8a). The molecular function of MYBL2, PLK1 and KIF20A was also analyzed in HL-60 cells. RNA interference of MYBL2 significantly downregulated the expression of MYBL2. Cell proliferation was also inhibited when the expression of MYBL2 was downregulated by RNA interference (Fig. 8b). Figure 8c, d show that downregulation of PLK1 and KIF20A resulted in inhibition of proliferation and induction of apoptosis in HL-60 cells. Cell senescence β-galactosidase staining analysis showed that in the Si-MYBL2 group, the number of positive cells was increased compared with the Si-Nc control group (Fig. 9a). Cell cycle analysis showed that G1 phase cells in the Si-MYBL2 group increased significantly (Fig. 9b). DNA staining with Hochest 33,342 showed that nucleus became larger and irregular in the Si-MYBL2 group cells (Fig. 9c). These results imply that LEE011 induced senescence in AML cells, partially through down regulation of the transcriptional expression of MYBL2. MYBL2 may be a new target of LEE011, but molecular function analysis of other target genes of LEE011 is still required. Currently, three selective CDK4/6 inhibitors, palbociclib (PD-0332991), ribociclib (LEE011) and abemaciclib (LY2835219), have been clinically approved or are in late-stage clinical trials . LEE011 (ribociclib) is an orally-applied, effective small molecule that inhibits CDK4/6 at nanomolar concentrations. Antitumor activity of LEE011 has been demonstrated in several cancer models. Sixteen active clinical trials are currently underway with LEE011 as a single agent or in use in combination with other drugs [30, 31]. Most trials with LEE011 are for solid tumors including melanoma, breast cancer and neuroblastoma, and there have been no clinical trials of LEE011 in leukemia or other cancers of the hemopoietic system. In this study, we showed for the first time that LEE011 treatment results in inhibition of cell proliferation and induction of G1 arrest and senescence in leukemia cells. 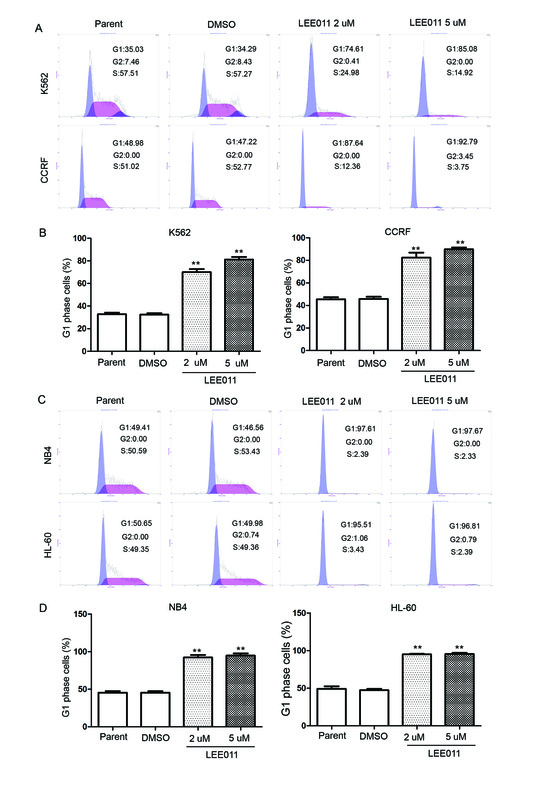 The lncRNA microarray was used to determine mRNA and lncRNA expression profiles in LEE011-treated HL-60 cells and demonstrated that LEE011 induced cellular senescence partially through downregulation of the expression of MYBL2. MYBL2 is emerging as an important gene in cellular senescence. When cells are senescing, MYBL2 has been shown to consistently be the most downregulated gene . As reported previously, ectopic expression of MYBL2 in HMF3A cells can bypass cell senescence . In rodent cells, premature senescence caused by the Ras oncogene can be rescued by MYBL2 expression. Moreover, downregulation of MYBL2 with siRNA silencing leads to increased senescence in primary human foreskin fibroblasts and HeLa cervical cancer cells . These results strongly imply an important role for MYBL2 in senescence. However, it remains to be determined what regulates the expression of MYBL2 and whether MYBL2 could be a novel anti-tumor target . In this study, MYBL2 was downregulated in HL-60 cells treated with LEE011 and cell senescence β-galactosidase staining analysis showed that in Si-MYBL2 cells, positive staining was increased when compared with the Si-Nc control group. Cell cycle analysis showed that G1 phase cells increased significantly and nucleus became larger and irregular in the Si-MYBL2 group cells. These results imply that LEE011 induces senescence in AML cells partially through downregulation of the transcriptional expression of MYBL2. Therefore, our study may provide new clues into the mechanism of senescence induced by LEE011 in AML cells. In this study, we have shown that LEE011 treatment resulted in inhibition of cell proliferation and induction of G1 arrest and cellular senescence in leukemia cells. The lncRNA microarray was used to identify mRNA and lncRNA expression profiles in LEE011 treated HL-60 cells and we demonstrated that LEE011 induces cellular senescence partially through downregulation of the expression of MYBL2. These results may provide new insights into the molecular mechanism of the anticancer effects of LEE011 and its potential as a candidate drug for leukemia; however, further research will be required to determine the underlying details. PJ and HSY designed and directed the study. TYF, WNN, LZH and XLX finished the most of experiments. WY and LXL finished the cell culture and proliferation analysis. LM and QGH finished the Hochest 33,342 analysis. FF, LYP and XYY finished the apoptosis tunnel analysis. LYH and HWQ supported the design of animal experiment. RJL and DWW finished the western blot analysis. LJ drafted this manuscript. FX, WJ and HWQ participated in study design and coordination, data analysis and interpretation and drafted the manuscript. All authors read and approved the final manuscript. We thank Professor Yang Zhi-Hua and Ran Yu-Liang (Cancer Institute/Cancer Hospital, Chinese Academy of Medical Sciences and Peking Union Medical College, Beijing, China) for kindly help. The microarray dataset supporting the conclusions of this article, is available in the gene expression omnibus (GEO) with the Accession Number GSE81060 (http://www.ncbi.nlm.nih.gov/geo/query/acc.cgi?acc=GSE81060). This study was according to the recommendations in the Guide for the Care and Use of Laboratory Animals of the National Institutes of Health. Protocol has been approved by the Committee on the Ethics of Animal Experiments of Soochow university (Permit Number: No.SUEC2013-022). This work was supported by grants from National Natural Science Foundation (81570125, 81370627, 81300423, 81502500, 81501703, 81501840, 81502157, 81501700, 31500718), Natural Science Foundation of Jiangsu Province (BK20151207, H201420), key medical subjects of Jiangsu province (XK201120), Innovative team of Jiangsu Province (LJ201114, LJ201126), Special clinical medical science and technology of Jiangsu province (BL2012050, BL2013014, BL2012051), Major scientific and technological special project for “significant new drugs creation” No. 2012ZX09103301-040. 12935_2017_405_MOESM1_ESM.jpg Additional file 1. Cell cycle analysis of acute leukemia cells treated with LEE011. Cell cycle analysis showed the cells treated with LEE011 2 and 5 μM for 48 hours, results showed in these acute leukemia cells, LEE011 induce the cell cycle G1 arrest very significantly. G1 phase cells in K562 treated with 5 μM group was 81.23±3.84% vs. DMSO group 32.46±2.21%, P<0.01. G1 phase cells in CCRF treated with 5 μM group was 89.83±2.67% vs. DMSO group 45.80±3.24%, P<0.01. G1 phase cells in NB4 treated with 5 μM group was 94.79±4.93% vs. DMSO group 45.59±3.12%, P<0.01. G1 phase cells in HL-60 treated with 5 μM group was 95.50±2.97% vs. DMSO group 47.40±3.00%, P<0.01. ** P < 0.01. 12935_2017_405_MOESM2_ESM.jpg Additional file 2. Cell cycle analysis of acute leukemia cells treated with LEE011. Cell cycle analysis showed the cells treated with LEE011 2 and 5 μM for 48 hours, results showed in these acute leukemia cells, LEE011 induce the cell cycle G1 arrest very significantly.G1 phase cells in MV4-11 treated with 5 μM group was 83.82±2.81% vs. DMSO group 44.66±1.90%, P<0.01. G1 phase cells in SHI-1 treated with 5 μM group was 87.39±2.80% vs. DMSO group 45.25±4.61%, P<0.01. G1 phase cells in THP-1 treated with 5 μM group was 50.51±8.17% vs. DMSO group 45.64±6.46 %, P=0.466. G1 phase cells in U937 treated with 5 μM group was 89.99±3.54% vs. DMSO group 54.26±2.92 %, P<0.01. ** P < 0.01. 12935_2017_405_MOESM3_ESM.xls Additional file 3. Differentially Expressed mRNAs up regulated in HL-60 cells treated with LEE011. 12935_2017_405_MOESM4_ESM.xls Additional file 4. Differentially Expressed mRNAs down regulated in HL-60 cells treated with LEE011. 12935_2017_405_MOESM5_ESM.xls Additional file 5. Differentially Expressed LncRNAs up regulated in HL-60 cells treated with LEE011. 12935_2017_405_MOESM6_ESM.xls Additional file 6. Differentially expressed LncRNAs down regulated in HL-60 cells treated with LEE011. 12935_2017_405_MOESM7_ESM.xls Additional file 7. Summary of KEGG analysis the differentially expressed mRNAs in HL-60 cells treated with LEE011.